Ths Seventh Regiment Departs, by Thomas Nast. This romantic view by Nast shows the 7th NY Militia’s departure for Washington, DC. in the spring of 1861. One might think that after one has written over 100,000 words on a subject–in this case, Ambrose Bierce and the Period of Honorable Strife–one has said all there is to say on a subject. But that is not the case; there are any number of miscellaneous sources, topics or quotes which simply don’t fit into the book; similarly, for every question which one answers about this enigmatic American author, other questions arise as a result of new research or discoveries. Here below, for example, is a classic bit of Bierce: Ambrose Bierce declaiming against a famous Civil War regiment whose fame Bierce felt was less than deserved. In the early days of the war, when Washington was virtually surrounded by Secessionists, the arrival of the 7th NY Militia was eagerly anticipated and they were widely viewed as the saviors of the Nation’s Capitol. Might have sentenced that impetuous organization to be shot at and, if overtaken, hit. 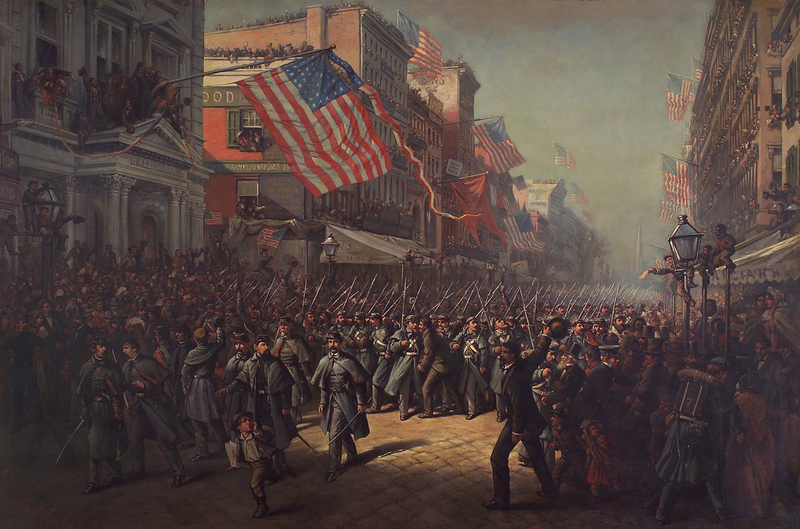 As it was, the Bloody Seventh advanced upon Washington, then held by a superior force of the regular army, captured and occupied some of the strongest hotels in the place, and after several weeks of brilliant and startling dress parades returned as grizzled veterans in New York without the loss of a man. The regiment did not re-enlist, but in Central Park a costly monument to its valor, “Like a tall bully, lifts its head and lies”; for it is inscribed with names of “members of the Seventh” who fell in battle. There is nothing to show that, righteously disgusted with their own regiment’s policy of peace on earth and good will to men, they had left it, and that they fell as members of less pacific organizations. It is not so very bad to be “dead upon the field of honor” if one have the good luck to be counted twice—a double patriot with twin renowns. In unanimously voting to remain at home while Spain is abroad, and thereby drawing upon themselves a hot fire of patriotic reprobation, the star-spangled Quakers of the Seventh are especially blamable, for they compel many a war-willing patriot to remain at home also in order to deliver the fire. As members of the firing squad some of us are withholding from the service of our country military abilities of the highest order. For more on the Civil War, also see Ambrose Bierce and the Period of Honorable Strife. Also read Ghosts and Haunts of the Civil War and The Paranormal Presidency of Abraham Lincoln. Best known for his sharp tongue and quick wit, Ambrose Bierce fought for the Union during the Civil War and fought bravely. This book chronicles his war service and traces his transformation from young idealist to mature cynic. Ghosts and Haunts of the Civil War (HarperCollins). True uncanny tales of the Civil War. This book for the first time documents Abraham Lincoln’s beliefs and experiences dealing with the paranormal. The Paranormal Presidency chronicles his prophetic dreams, premonitions and beliefs, as well as his participation in séances and Spiritualism.